The Rinzai Zen Mission is pleased to invite you, your family, and friends to our Obon service and dance. 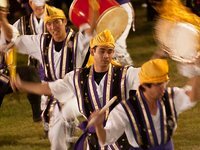 Please come and experience the traditional dance styles of Okinawa, the only one of its kind on Maui. We look forward to seeing all of you as we share our live Okinawan music and performances as well as the delicacies offered by our community. Saturday, 8/18 - 7:00 p.m.; service: 6:00 p.m.
daniyang8 . 更新日 7月 17 2018 1:04 p.m.